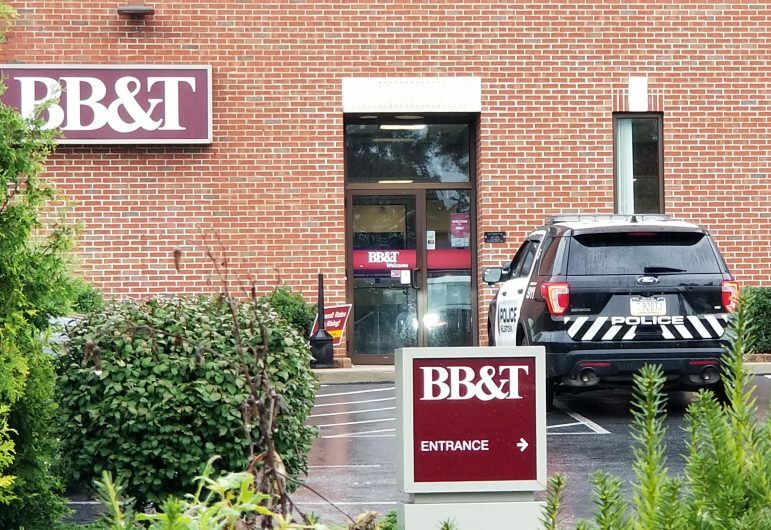 A Lower Saucon Township man has been charged with allegedly carrying out an armed robbery at the BB&T bank branch at 741 Main Street, Hellertown, on Monday afternoon, borough police announced in a news release Saturday. A Hellertown Police SUV is parked outside the BB&T branch at 741 Main Street shortly after a reported robbery took place there Monday. According to Police Det. Michael Dattilio and online court records, Kurt M. Laudenslager, 47, of 1910 Skibo Road, has been charged with Felony 1 Robbery, Felony 3 Theft, Felony 3 Receiving Stolen Property and Misdemeanor 2 Simple Assault. Police have not said how much money was allegedly stolen from the branch, but did release surveillance images of the suspect and stated in an earlier news release that he allegedly displayed a stainless finish revolver in the commission of the crime. They also said the man changed clothes while fleeing the scene of the crime, in an alley not far from the bank. 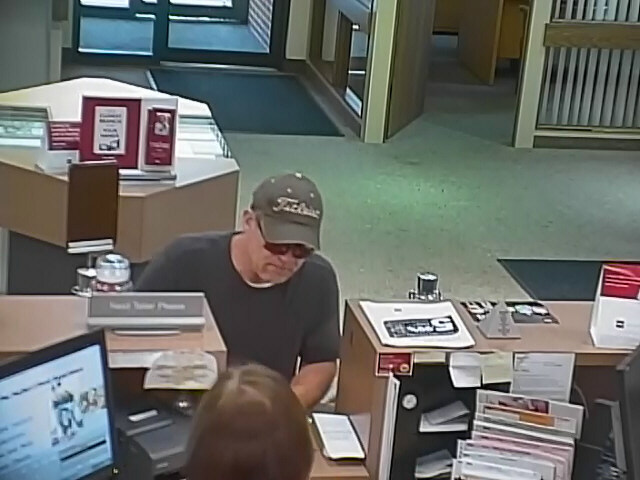 Hellertown Police earlier released this photo of the man who robbed the BB&T branch at 741 Main Street at around 5 p.m. on Monday, Sept. 17, 2018. According to police, the man has since been identified as Kurt M. Laudenslager, 47, of Skibo Road, Lower Saucon Township. Laudenslager is now charged with several felonies related to his alleged involvement. Dattilio said Saturday that Laudenslager was developed as a suspect in the course of the police investigation into the robbery, and that he was arrested Friday evening. Laudenslager was arraigned early Saturday before District Judge Alicia Zito of District Court 03-3-03 and committed to Northampton County Prison in lieu of $75,000 straight bail, which as of 1 p.m. Saturday had not been posted, according to online court records. A preliminary hearing in the case is scheduled to be held at District Court 03-3-03 on Friday, Oct. 5 at 9 a.m., per court records. Court records indicate that in June 2013 Laudenslager pleaded guilty to theft-related charges in the Northampton County Court of Common Pleas in another Hellertown borough case–also investigated by Det. Michael Dattilio–in which he was charged with forgery, theft, receiving stolen property and access device fraud. That case stemmed from Laudenslager’s theft of money from his then-fiancee, according to a WFMZ News story published in 2013. According to Northampton County court records, as part of a plea agreement Laudenslager was sentenced by Judge Craig Dally to serve a maximum of 36 months of probation after pleading guilty to Felony 2 Forgery and to serve 115 days to 23 months in jail–with credit for any time already served–after pleading guilty to Felony 3 Theft. Laudenslager was also ordered to pay more than $2,500 in court costs and nearly $17,000 in restitution, to undergo periodic/random drug screenings, to undergo psychiatric and pscyhological evaluations and follow recommended treatment, and to obtain and maintain full-time employment following his release from jail, as conditions of his sentence. The court records state that upon his parole he was to live in an “inpatient facility,” and attend Gamblers Anonymous, Narcotics Anonymous and Alcoholics Anonymous meetings, and to comply with outpatient treatment once released from the inpatient facility. In another Lehigh County case from March 2011, Laudenslager was charged with theft after allegedly stealing more than $1,000 from the Old Navy store at The Promenade Shops at Saucon Valley, where he was employed at the time. According to a story published on Upper Saucon Patch which cites a police criminal complaint, “Laudenslager freely admitted to taking the money, and signed a confession for Old Navy personnel” in which he allegedly admitted to stealing the money in order to pay traffic citations, cover a bounced check and buy groceries. According to Lehigh County court records, in the Upper Saucon Township case Laudenslager pleaded guilty to Misdemeanor 1 Theft in October 2011 and was sentenced by Judge Lawrence Brenner to serve a minimum of two months and a maximum of 23 months in jail.